Proper grooming is essential to keeping dogs healthy. Well-intentioned pet owners often struggle with grooming tasks due to busy schedules, reluctant pooches, and a lack of knowledge or skill. If you have a natural chemistry with our best friends and are looking for a fun and engaging new career opportunity, consider investing in one of the most prominent franchises in the mobile dog grooming business: Aussie Pooch Mobile Dog Wash.
Six years after a passionate, charismatic, and ambitious 16-year-old developed a name for herself providing excellent clipping and dog grooming services, Christine Taylor established Aussie Pooch Mobile Dog Wash. Since 1991, we’ve built a successful and award-winning business by providing comprehensive dog grooming services out of our cutting-edge grooming vans. Nearly 30 years since our founding, with 200 worldwide operating franchises, we attribute our wide-spanning success to a supportive franchise model that features low fees, entry costs, and overhead expenses. The Aussie Pooch Mobile Dog Wash brand leads with ultimate convenience and follows up with patient, compassionate, and attentive care. We bring our mobile dog grooming business to the pet owner: this reduces your overhead expenses as you don’t have to rent salon space, and the familiar environment keeps dogs calm and comfortable. There are also plenty of other reasons why the Aussie Pooch Mobile dog wash trailer is a more convenient, affordable way to care for dogs. Our friendly, experienced, trained, and certified groomers take their time with each pooch, tending to all grooming needs. On top of basic washing, nail clipping, ear cleaning and flea treatment application, we offer additional services such as , de-shedding, grooming and trimming, Aromacare rinses, Pooch Massage, Dog Facials, medicated washes, and conditioning treatments. We are so confident in our thorough service that if a dog isn’t returned flee-free and smelling great, the wash is free! With such a bold guarantee, it’s no wonder we seek out only the most passionate dog-lovers to join our grooming team. Don’t miss a life-changing opportunity to turn every day into a playful romp at the park. Our mobile dog grooming business is for sale in all Australia’s metropolitan hubs. We’re looking for enthusiastic and self-motivated individuals to expand our beloved and internationally-trusted brand. No experience is necessary: all you need is natural patience with dogs and a willingness to learn. We offer all the training necessary to achieve certification and maintain our brand’s service standards. 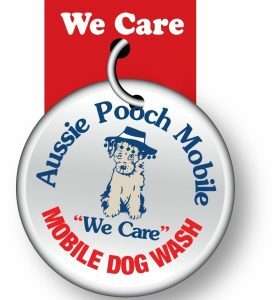 Join an international team of like-minded dog-lovers committed to grooming excellence when you invest in Aussie Pooch Mobile Dog Wash.
A mobile dog grooming business lets you be your own boss: set your own hours and manage your own potential. If you do something you truly love, you’ll never work another day in your life. Turn your new mobile dog wash business into a full-time endeavour or a part-time commitment. The decision is in your hands. We make investing in our mobile dog wash business for sale simple and easy.